Recently a lot of buzz has been about including more and more fibres in our diet. Truly speaking our body doesn’t even have the mechanism to digest and absorb the fibres. Then what makes them such important part of the human diet? Dietary fibres are also known as roughage. Well, if consider our bodies to the machines and gut as the fuel system, then fibre is the engine oil. While engine oil is not the fuel, it certainly is what keeps the engines neat and working. Same goes for fibres. What do the Fibres do? Dietary fibres improve bowel function drastically. They add bulk to the food that keeps the bowel moving, thus helps in getting rid of the wasteful products after the digestion. They (water soluble fibres) also help in retaining a good amount of water in the bowels. Moreover, the good bowel movement means lesser chances of bacterial growth. Thus, fibre takes care of constipation and flatulence. Dietary fibres keep the entire digestive system running smooth and quick. No constipation means no blockage of the waste, the food material moves adequately, hence preventing bloating and stomach upset. Dietary fibres are known to keep the heart healthy. They keep the blood pressure in check. Also, reduces the cholesterol levels. Thus, the cardiac strain is reduced keeping the heart healthier. A good amount of fibres in the diet would mean that you would be consuming lesser calories—fats and carbohydrates, hence lesser sugar levels. Also, fibres slow down the sugar absorption and assimilation from the food. People who suffer from diabetes are particularly affected by high sugar intake, hence worsening the situation. Thus, fibre diet is ever greater for diabetes patients. Dietary fibres keep the sugar levels in check, neither too high nor too low, keeping your overall health in check. The mechanism is simple. 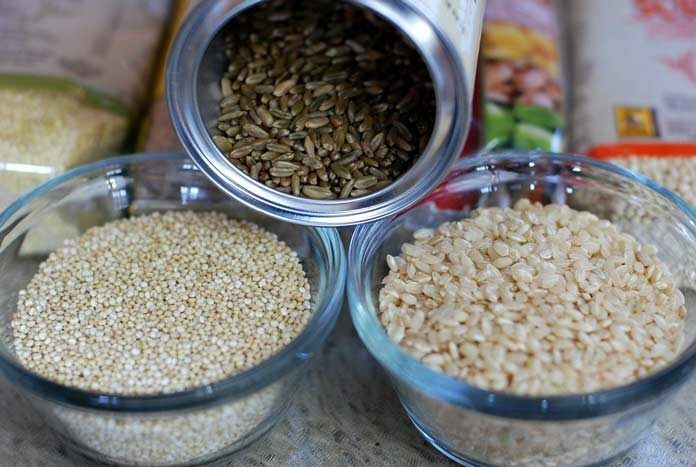 Fibre rich diet satiates your appetite earlier while consuming less fats and carbohydrates, hence lesser calories. Lesser calories mean lesser weight. What food contains dietary fibres? Dietary fibres are present in a variety of food sources which means you might already be taking plenty of it. These can be water soluble or water insoluble, both advantageous to our digestive system. Water soluble fibres are found in foods like apples, carrots, oats, beans, peas and citrus fruits. Water insoluble fibres are present in food like whole wheat, beans, nuts, potatoes and cauliflower. If you’re eating fruits for the fibres it is advised to that you eat the whole fruit rather than taking juice, as most of the fibre content is lost with the leftovers from the juiced fruits. Fruits and vegetables are rich in both kinds of fibres.